New York, NY — October 26, 2016— Idesco Corp., a leading New York-based security systems integrator, today announced that the company will be exhibiting at the ISC East Trade Show, the largest security show in the Northeast. 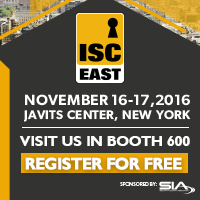 The ISC East show will take place on November 16th-17th at the Javits Center North in New York City and attracts over 4,500 physical security buyers from the Northeast corridor. At the show, Idesco will be showcasing its new ID card and access control solution at Booth #600 and feature security products from the top manufacturers in the industry. Attendees will be able to see how a true integrated security solution works and the advantages of bringing together disparate systems into one powerful security solution. During the show, attendees can stop by booth #600 to get security tips from Idesco’s security advisors and find out how an integrated security solution can meet their requirements of keeping their facility safe and secure at all times. For more information, call Idesco at 212-889-2530 or visit www.idesco.com.